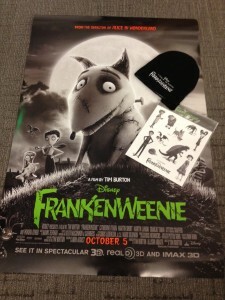 Frankenweenie prize pack includes a movie poster, sticker pack, beanie hat and 2 TICKETS TO THE MOVIE! Ok, we know you’re all excited about Disney’s new movie, Frankenweenie, which features the amazing storytelling expertise of Tim Burton (who you might remember from Nightmare Before Christmas) once again…and if you’re not, we assure you your kids are! We are definitely ready for some more spooky fun from Tim Burton and Disney! In fact, we’re so excited that we just had to call up Disney and get a gift pack just for you! Enter here for our giveaway and your chance to win a Frankenweenie Beanie hat, poster, sticker pack and yes, 2 TICKETS TO THE MOVIE!! We have TWO of these prize packs to give away but sadly, only one is going to get those coveted tickets. So enter soon and enter often! …And YOU could be our winner! The movie features a young boy named Victor whose beloved dog Sparky (who stars in Victor’s homemade monster movies) is hit by a car. Victor refuses to accept the loss of his friend and vows to bring him back. He has some curious success…but when the bolt-necked “monster” wreaks havoc on Victor’s neighbors, he has to convince them (and his parents) that despite his appearance, Sparky’s still the good loyal friend he’s always been. This is a stop-animation version of the live action film Frankenweenie (1984) and reunites Tim Burton withWinona Ryder and Catherine O’Hara who previously worked with Burton on Beetlejuice. You can also enter this giveaway on the PetsWeekly.com website (the only place to go for all things pet related!) who has joined us for this promotion in honor of Sparky, the faithful Frankenweenie! We have also created a custom Frankenweenie icon JUST for this movie and ONLY for the months of September and October to put on your child’s calendar as we all anticipate this upcoming event! Check it out in our image gallery and make your child’s calendar today for free! Want to check out the latest trailer?…click here!